For those interested in Modern Art but still not familiar with all the day to day terms used by galleries we have produced this list of definitions. We hope you find them useful. If there are any art terms not listed which you know of or would like answered please email us and we will try and help. ABSTRACT - Art which departs from real subjects and representational accuracy in preference to shapes, colour and texture. This form of British Art is sometimes referred to as non-representational art. ARCA - Associate of the Royal Cambrian Academy(ARCA). Founded in 1826 the RCA claims no one knows what the true definition of Welsh Art is, but if it exists, it can be seen at the Royal Cambrian Academy. ARPE - Associate of the Royal Society of Painters and Etchers (ARPE) . Founded in 1880 as Society of Painter- Etchers and later enlarged to include Engravers, the RPE was granted a Royal title in 1888. The RPE includes various kinds of artist prints in its exhibitions and elects artists working in any of the various printmaking media. ARWS - Associate of the Royal Watercolour Society (ARSW). The Art Society has the proud distinction of being the first institution anywhere in the world to specialise in watercolours, and in its Victorian heyday it inspired similar Artist organisations throughout Europe. As the first body of artists to both secede from the Royal Academy and establish an independent identity for itself, it set a precedent for many other British art societies. BM - Founded in 1753 The British Museum (BM) holds in trust for the nation and the world a collection of art from ancient and living cultures. Housed in an architectural British landmark, the collection is one of the finest in existence, spanning two million years of human history. Access to the collections is free. BRITISH IMPRESSIONISM - The French Impressionist artists Daubigny, Monet, and Pissarro spent considerable time living and painting in London. But the development of British Impressionism revolved around - an American, James McNeill Whistler. He introduced the British to Impressionism in the early 1860's after moving from Paris. Other British artists that Whistler encouraged in this new art form were Sickert, Scott, Steer and Roussel. The development of British Impressionism was further promoted with the founding of the New English Art Club (NEAC) in 1886. CASTING - The method by which Artists produce Sculptures. Liquid materials such as clay, bronze and plastic are poured into a mold and allowed to cool and harden. The material is transformed into the shape of the mold. British Artists showing at Red Rag Modern British Art Gallery and using this process include: Stuart Anderson , Margaret Lovell and Guy Portelli. COLLAGE - A painting technique used by artists where groups of different textured materials or objects are glued together to make a work of art. 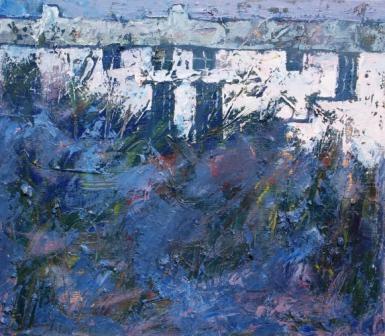 CONTEMPORARY ARTIST - The term contemporary artist applies to all British Art being undertaken now. Generally it refers to any British Art made from around the 1960s to the present, or after the end of the modern art period. 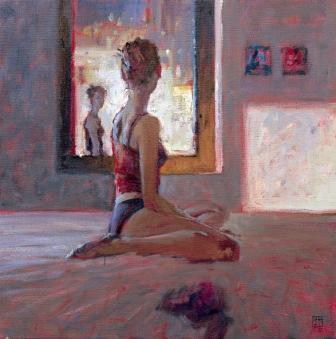 All Red Rag paintings are obtained from British Contemporary Artists who are living artists. CONTEMPORARY BRITISH ART - Generally defined as British Art which was produced from the second half of the twentieth century upto today. EN PLEIN AIR - "in the open air" is a term describing paintings that have been undertaken outdoors rather than in the Artist's studio. Plein air painting was taken up by the English painters John Constable (1776-1837) and it became common place for Impressionists painters. Its popularity was aided by the development of easily portable painting equipment and materials, including paints sold in tubes. 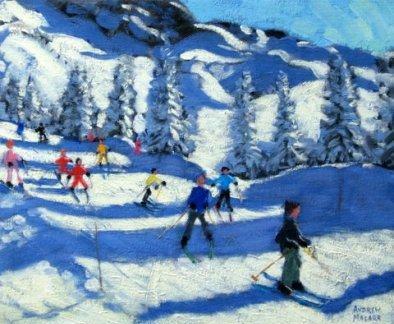 British Artists showing at Red Rag Modern British Art Gallery and painting en plein air include: Andrew Macara and John Martin . NPG - National Portrait Gallery (NPG). Founded in 1856 to collect portraits of famous British men and women, the art collection represents the most comprehensive of its kind. OFFSET LITHOGRAPH - Offset Lithograph has become the most widely used commercial printing process for art prints. This is a method of printing from a metal or stone surface on which the printing areas are made ink-receptive. Rather than pressing inked images onto paper using plates with raised or etched plates, an image is transferred to the paper using oil-based inks, chemically-treated plates made from photographic negatives, and an offset cylinder. Today the field of signed and numbered offset lithographs has become accepted in the art market and many have proved a reasonable British Art Investment. PASTEL - A medium made from gum and water, which when pressed into a dried stick form produces crayons. Chalk is similar to pastel, but more tightly bound. 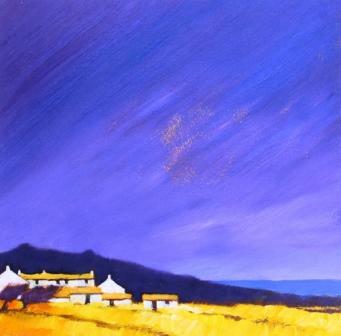 British Artists showing at Red Rag Modern British Art Gallery and who paint using Pastels include: Moira Huntly . PS - The Pastel Society (PS) was founded in 1898 and is widely recognised for the promotion and development of pastel painting. 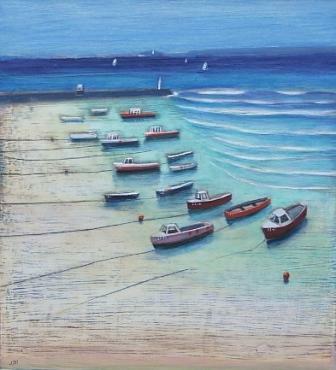 There are over 50 artist members who are professional British artists using Pastels. 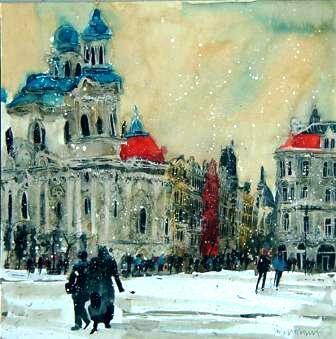 The PS President is Red Rag Gallery artist Moira Huntly . 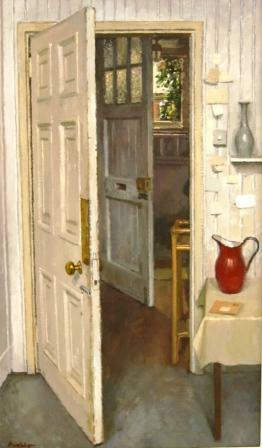 RBSA - Royal Birmingham Society of Artists. 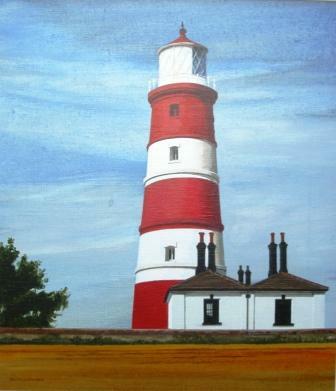 Red Rag British artists John Lines and Simon Davis are RBSA members. Romeo di Girolamo is an honary RBSA member. 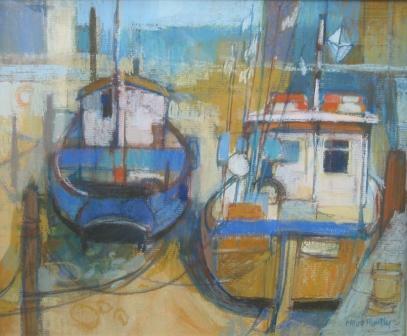 RSMA - Royal Society of Marine Artists - The RSMA has represented the finest in British contemporary marine art for nearly 60 years. 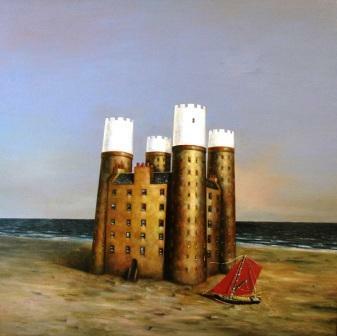 The Art featured is of the sea and everything connected with it and artist members' interpretations are as wide and varied as the subject. RWS - The Royal Watercolour Society has the proud distinction of being the first art institution anywhere in the world to specialise in watercolours, and in its Victorian heyday it inspired similar Artist organisations throughout Europe. As the first body of artists to both secede from the Royal Academy and establish an independent identity for itself, it set a precedent for many other British societies. STILL LIFE - Arrangement of subjects typically flowers, fruit and tableware. The organisation and relationship of the objects to one another together with contrasting colours and shapes provide interest. British Artists showing at Red Rag Modern British Art Gallery and specialising in Still Life art include: Tobias Harrison and Dawn Sidoli. SWA - The Society of Women Artists (SWA) was established in 1855, to give talented women artists an opportunity to exhibit their work. The British based Society continues to encourage variety and versatility and has some of the finest contemporary women artists, from all over the world, sustaining a reputation for excellence. TEMPERA - A traditional painting medium which requires the Artist to make-up his paints each day using egg yolk as a binder. TWASI - The Wildlife Art Society International (TWASI) was founded in 1992 with the purpose of promoting a greater appreciation of the wildlife art genre, the animals, plants and wild places which provide the stimulus and inspiration for all such work. The Society acts as a forum for contemporary wildlife artists, providing opportunities for them to share their common interests and raise their individual profiles through Society exhibitions and other events. British Arts have historically viewed fine arts, painting, sculpture and printmaking as different to the craft areas of applied art, design, jewellery and textiles. This is difference is attributed to the work of a group of artists led by William Morris known as the Arts and Crafts Movement whose political aim was to value all art forms. The movement was at odds with modernists who wished to keep high arts from the masses by keeping them esoteric.